... Continuation from where I left off HERE. We were doing a evening island hopping tour. By the time we reach our final island the sun was almost setting. A totally different feeling for me. Islands we visited was so quiet and deserted, a calm peaceful setting I would say. No rushing, no kids screaming, no one photobombing your pictures. A few pictures of this wonderful rock formation. The skies looked like a bed made of cotton, the sun looks mellow and heart warming. Me looking left and right, lol. I really really loved the background and was taking a few pictures so I can have one for my desktop haha. By the way this island is called Doda Island. Look at those clouds! The formation. Well basically the water is clear blue, even the skies are clear AND blue. Ah bliss! Spend the rest of our time chilling on the cool fine sand. Was really hoping for a tan, but chilling was great too! In the city I can never stop think (especially over thinking) but here my mind was cleared. Only the sounds of the waves crashing, birds chirping and the slight gentle breeze in my hair. Our boats men was our chef. Not bad. They whipped up a BBQ dinner for us with chicken, squid and fish. After the light BBQ dinner we all got to catch the beeeeeaaautifuuuul sunset before heading off! Yeap I can imagine how packed it'll be in the afternoon! It's probably the same as Maya Island . Cotton candy - paddle pop skies anyone? Everyone was just sitting around taking it all in. Sometimes the beauty of the world makes you think to yourself, "How have I not seen this?" when we have skies every where, sunsets every day. This time it's Erin doing a bridge haha! So you might be thinking we headed back straight to the bay after this. Well we still had one more stop! It got quite freaky as I couldn't see anything outside of the boat (plus my eyesight is horrid at night!) and I was thinking of all the worst scenarios. Bad choice Steph, bad choice. We stopped in the middle of the ocean for night snorkeling. Yes, snorkeling in the middle of nowhere at 9pm in pitch black! Is that crazy or what? When I read what we were supposed to be doing, I did see night snorkeling but I never expected this! It was crazy but amazing at the same time. Well you must be thinking what are they going to see in the middle of the night with no lights at all (the pictures are taken with flash), well the island near Ao Nang the main beach in Krabi has soils which are rich in phosphorus and potassium. These minerals glows at night in the water, so what you see when you snorkel are like stars! After the quick snorkel we headed back to Ao Nang as it's pretty and late and quite dangerous especially with high tides coming in. It's so dark my camera couldn't even focus. Not even a beam of light. 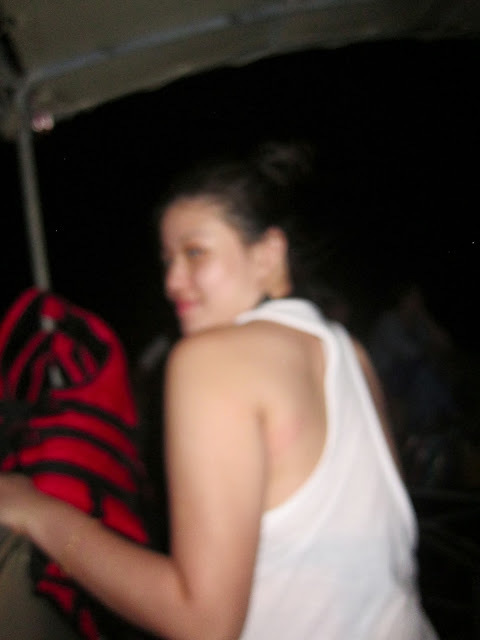 I had fun over all and it was a great learning experience and first time night snorkeling.